Jesse Owens competes in one of the heats of the 200-meter run at the 1936 Olympic Games in Berlin. GWEN OUTEN: This is Gwen Outen. STEVE EMBER: And this is Steve Ember with People in America in VOA Special English. Every week we tell about a person who was important in the history of the United States. 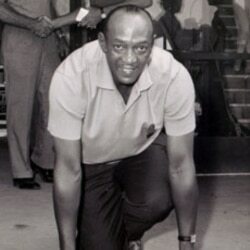 Today we tell the story of athlete Jesse Owens. He once was the fastest runner in the world. GWEN OUTEN: In the summer of nineteen thirty-six, people all over the world heard the name of Jesse Owens. That summer, Owens joined the best athletes from fifty nations to compete in the Olympic games. They met in Berlin, Germany. There was special interest in the Olympic games that year. STEVE EMBER: Jesse Owens was black, too. Until nineteen thirty-six, very few black athletes had competed in the Olympics for the United States. Owens was proud to be on the team. He was very sure of his ability. STEVE EMBER: Owens spent one week competing in four different Olympic track and field events in Berlin. During that time, he did not think much about the color of his skin, or about Adolf Hitler. GWEN OUTEN: We do not know what Hitler thought of Jesse Owens. No one recorded what he said about this black man who ran faster and jumped farther than any man of any color at the Olympic games. But we can still see Jesse Owens as Hitler saw him. For at Hitler's request, motion pictures were made of the Berlin Olympic games. 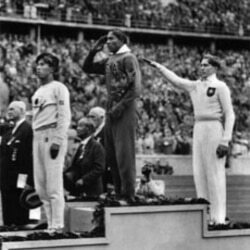 Jesse Owens, center, salutes during the presentation of his gold medal for the long jump, after defeating Nazi Germany's Lutz Long, right, during the 1936 Summer Olympics in Berlin. Naoto Tajima of Japan, left, placed third. STEVE EMBER: Owens's Olympic victories made him a hero. He returned home to parades in New York City and Columbus, Ohio, where he attended the state university. Businessmen paid him for the right to use his name on their stores. No one, however, offered him a permanent job. GWEN OUTEN: Poverty was not new to James Cleveland Owens. He was born in nineteen thirteen on a farm in the southern state of Alabama. He was the youngest of thirteen children. His parents did not own the farm, and earned little money. Jesse remembered that there was rarely enough food to eat. And there was not enough fuel to heat the house in winter. Some of Jesse’s brothers and sisters died while still young. Jesse was a sickly child. Partly because of this, and partly because of the racial hatred they saw around them, Jesse’s parents decided to leave the South. They moved north, to Cleveland, Ohio, when Jesse was eight years old. The large family lived in a few small rooms in a part of the city that was neither friendly nor pleasant to look at. Jesse’s father was no longer young or strong. He was unable to find a good job. Most of the time, no one would give him any work at all. But Jesse’s older brothers were able to get jobs in factories. So life was a little better than it had been in the South. STEVE EMBER: Jesse, especially, was lucky. He entered a school where one white teacher, Charles Riley, took a special interest in him. Jesse looked thin and unhealthy, and Riley wanted to make him stronger. Through the years that Jesse was in school, Riley brought him food in the morning. Riley often invited the boy to eat with his family in the evening. And every day before school, he taught Owens how to run like an athlete. GWEN OUTEN: Owens always remembered the white man who helped change his life. Charles Riley did not seem to care what color a person's skin was. Owens learned to think the same way. Later in life, Owens put all his energy into working with young people. He wanted to tell them some of the things he had learned about life, work and success: That it is important to choose a goal and always work toward it. That there are good people in the world who will help you to reach your goal. That if you try again and again, you will succeed. 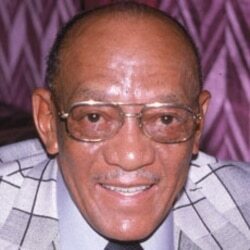 STEVE EMBER: In about nineteen seventy, Jesse Owens wrote a book in which he told about his life. It was called “Blackthink.” In the book, Owens denounced young black militants who blamed society for their troubles. He said young black people had the same chance to succeed in the United States as white people. Many black civil rights activists reacted angrily to these statements. They said what Owens had written was not true for everyone. Owens later admitted that he had been wrong. He saw that not all blacks were given the same chances and help that he had been given. In a second book, Owens tried to explain what he had meant in his first book. He called it “I Have Changed.” Owens said that, in his earlier book, he did not write about life as it was for everyone, but about life as it was for him. STEVE EMBER: This program was written by Barbara Dash. It was produced by Lawan Davis. This is Steve Ember. GWEN OUTEN: And this is Gwen Outen. Listen again next week for People in America in VOA Special English.